Surgeons can use a number of approaches to manage postoperative suprachoroidal hemorrhage. Suprachoroidal hemorrhage can occur from incisional intraocular surgery and occasionally from trauma, and can cause significant ocular morbidity. It can occur intraoperatively or postoperatively. Although there is no standard management protocol, in this article we describe pearls that we have found helpful in managing eyes with this condition. Key considerations include early detection, optimized medical management with close follow-up, and appropriately timed minimally invasive surgery, in some cases. Successful management increases the chance of visual recovery. Figure 1. 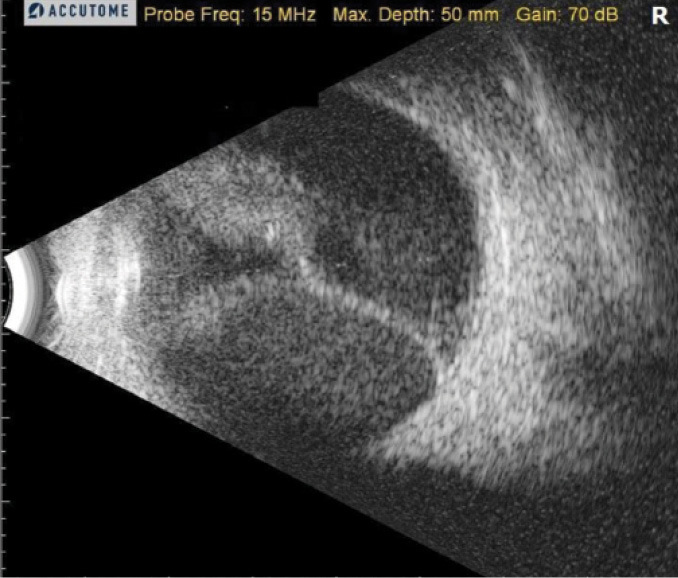 B-scan ultrasonography of appositional hemorrhagic choroidal detachments with partially liquefied clot. Hemorrhagic choroidal detachments can be identified via fundus examination or on B-scan ultrasonography. The main clinical features to assess are whether appositional choroidal detachments exist (Figure 1) and, less commonly, whether intraocular pressure (IOP) is elevated secondary to angle closure. In the absence of these findings, medical management, as described below, is indicated. The presence of appositional choroidal detachments or angle closure glaucoma increases the likelihood of requiring surgery. If surgery is required, medical management remains critical until surgical drainage occurs. There are no large randomized trials that support specific approaches to medical management. For eyes with focal or nonappositional choroidal detachments, cycloplegia and high-dose topical steroids usually treat inflammation and patient discomfort effectively and lead to resolution of the choroidal detachment over several weeks. Oral gabapentin, oral steroids, and sub-Tenon steroid injection have also been used with varying degrees of success. Patients who receive medical treatment still require regular follow-up. Some clinicians advocate temporarily stopping systemic anticoagulants and encourage patients to avoid activities that induce the Valsalva maneuver or increase blood pressure until the choroidal hemorrhage resolves. • Suprachoroidal hemorrhage is a potential complication of incisional intraocular surgery that can cause significant ocular morbidity. • Although no standard management protocol exists, successful management increases the chance of visual recovery. • If the eye requires surgery, it should be appropriately timed and minimally invasive. The goals of surgical intervention include draining the hemorrhage from the suprachoroidal space and maintaining normal ocular anatomy after surgery. The classic recommendation has been to wait 10 to 14 days to allow liquefaction of any clot prior to drainage in order to maximize egress of hemorrhage with minimal manipulation.1 Serial B-scan ultrasonography can also help determine when clot lysis occurs. Immediate surgery is rarely necessary, except in the event of uncontrolled IOP. 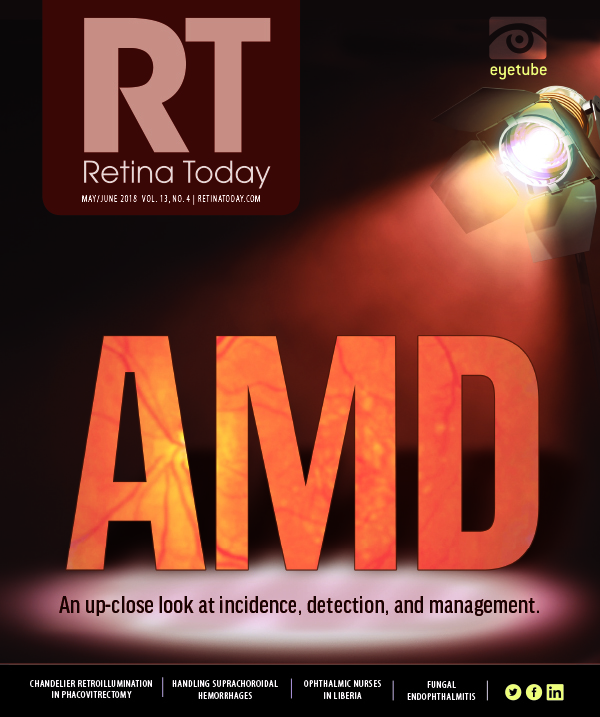 Concurrent rhegmatogenous retinal detachment and retained lens material may be reasons to consider prompt intervention, but it can be hard to perform the necessary surgical maneuvers in eyes with appositional detachments or large choroidal hemorrhage. Removing any meaningful amount of blood in the first few days after a choroidal hemorrhage develops can be difficult. In these cases, surgery should be performed as soon as enough hemorrhage is drained to enable safe vitrectomy. No one best technique exists, and the approach largely depends on surgeon preference. Many combinations of external drainage with or without intraocular infusion, pars plana vitrectomy, and scleral buckling instrumentation have been used. Maintenance of physiologic IOP can be achieved with either anterior or posterior chamber infusion. The extent of the choroidal detachment and the ability to visualize a posterior infusion cannula affects the location of infusion. If anterior infusion is used, we create a paracentesis with a 20-gauge microvitreoretinal (MVR) blade or 30˚ sideport super-sharp blade and use the Lewicky anterior chamber maintainer (Storz Ophthalmic Instruments) because it has a ribbed cannula that allows more stable positioning within the paracentesis. 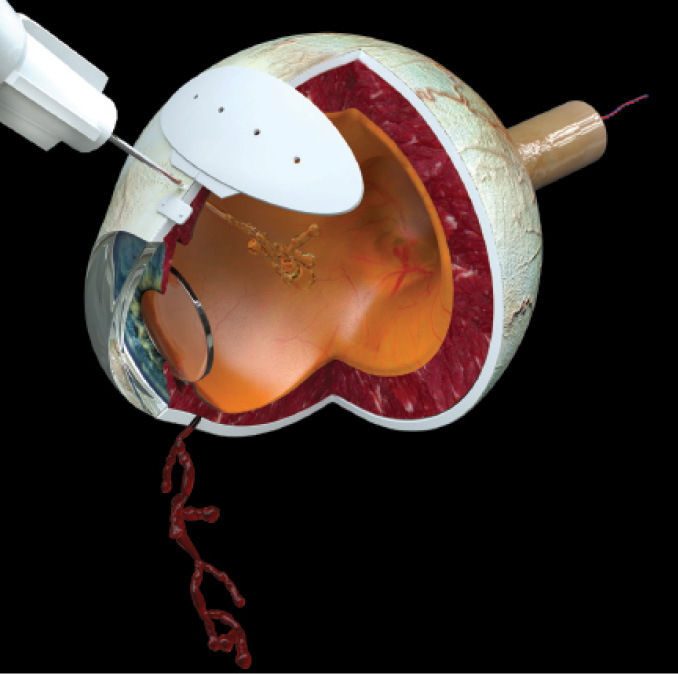 The anterior infusion can be hooked up to the vitrectomy machine’s infusion. Other surgeons prefer to place a 25-gauge vitrectomy infusion in the anterior chamber after creating a corneal wound.2 We have occasionally placed a 25-gauge butterfly needle with the infusion turned on, particularly in eyes with a flat anterior chamber. If posterior infusion can be used, we consider using a 6-mm cannula placed 2 mm to 2.5 mm posterior to the limbus. We do not angle these cannulas; we place them perpendicular to the sclera, if possible. These modifications facilitate visualization of the cannula and placement anterior to choroidal or retinal pathology. The patient’s lens status will play a role in infusion choice and location. We perform a conjunctival peritomy in the quadrant(s) spanning the largest extent of choroidal detachment (usually determined preoperatively by B-scan ultrasonography) and loop the adjacent rectus muscles using 4-0 silk traction sutures. We then use a 57 scleral blade (multiple vendors) to create a 3-mm radial sclerotomy 4 mm to 8 mm posterior to the limbus (Figure 2) and then use either the 57 blade or an MVR blade to enter the choroidal hemorrhage. We have also used a guarded drainage needle to drain the hemorrhage. Often only one sclerotomy site is necessary, but additional sites can be made if drainage is inadequate. If we don’t get prompt drainage from one site we move to another quadrant fairly quickly. Figure 2. Intraoperative photo following placement of anterior chamber infusion. Figure 3. Injection of OVD with concurrent drainage of suprachoroidal hemorrhage. Cotton-tipped applicators are placed against the globe to maintain appropriate IOP. A cyclodialysis spatula can also be placed into the wound immediately adjacent (parallel) to the sclera to loosen any coagulated blood. Depending on the size of the sclerotomy, an 8-0 polyglactin suture can then be used to close the sclerotomy site, although some surgeons prefer to leave the wound open to facilitate additional drainage of the hemorrhage. If other retinal pathology is present, such as a rhegmatogenous detachment or retained lens material, it can also be addressed once the sclerotomy is closed. We also routinely examine the retina for breaks or detachment. If vitrectomy is performed, placement of a gas bubble can help maintain the restored ocular anatomy and IOP. Other surgeons have had success with different surgical approaches, including a transconjunctival sutureless approach. To perform this, a 25-gauge trocar with a valved cannula is placed at a 15˚ angle to the sclera (parallel to the sclera to avoid the retina), approximately 7 mm posterior to the limbus. Drainage occurs similarly to the technique described above, with the potential advantage of more controlled drainage with use of the valved cannula. This approach may also be advantageous in eyes with glaucoma, as having relatively intact conjunctiva may make future glaucoma surgery more successful. After drainage, the cannula is removed and the site of incision is cauterized. The process can be repeated in other quadrants as needed. 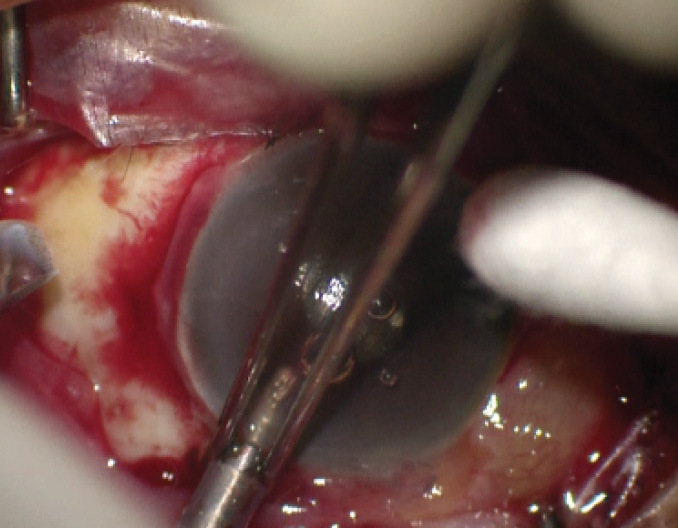 Along with other colleagues, we recently described the use of an ophthalmic viscosurgical device (OVD) to aid the drainage procedure.3 In an individual with suprachoroidal hemorrhage secondary to placement of a glaucoma drainage device, we use a 20-gauge MVR blade to create a full-thickness sclerotomy superotemporally. After initial passive drainage of the suprachoroidal hemorrhage, we inject an OVD into the vitreous cavity from another sclerotomy to create a tamponade, release choroidal apposition, and allow additional drainage of the hemorrhage (Figure 3). We repeat the drainage in other quadrants, if necessary. Compared with traditional approaches, this technique avoids the use of an infusion line, and the OVD helps maintain IOP both intraoperatively and postoperatively. 1. Chu TG, Cano MR, Green RL. Massive suprachoroidal hemorrhage with central retinal apposition: a clinical and echographic study. Arch Ophthalmol. 1991;109:1575-1581. 2. Rezende FA, Kickinger MC, Li G, Prado RF, Regis LG. Transconjunctival drainage of serous and hemorrhagic choroidal detachment. Retina. 2012;32(2):242-249. 3. Kurup SK, McClintic JI, Allen JC, et al. Viscoelastic assisted drainage of suprachoroidal hemorrhage associated with seton device in glaucoma filtering surgery. Retina. 2017;37(2):396-399.